So this is our first Home Truths. It’s the moment you’ll want to remember, so you can tell your kids where you were. We’re bringing you something you’ve never seen before in Melbourne’s property market. 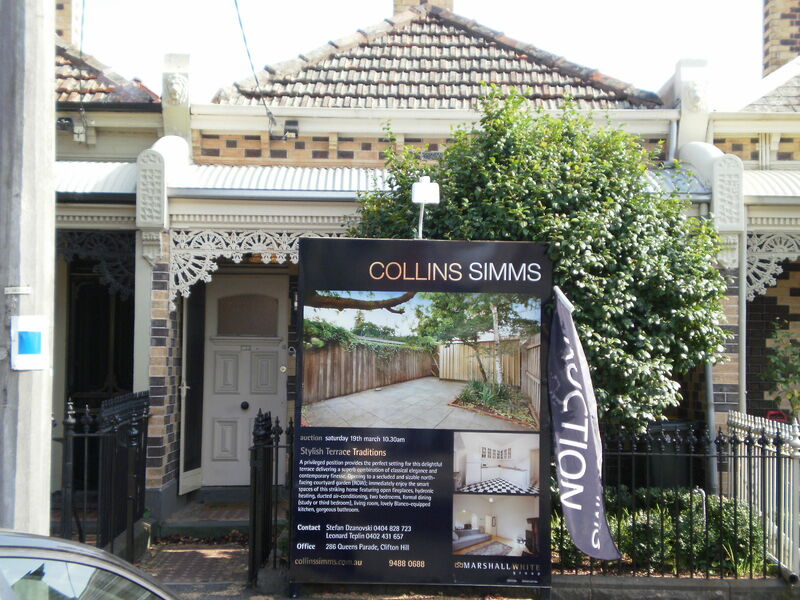 We’ll be providing a rundown on an Auction Saturday (19th March 2011), starting with our first niche coffee venue and ending with the last sale result. It’s an informal yet entirely informative blog where you can see who’s cool in Melbourne’s property scene… and who’s fool. So, take my hand and let’s go. Starting out in Brunswick East. Editor-in-Chief, Iolanthe. Who says property’s just about suits? Vibe: Autumn I love you. Clearance rates steady. Wearing: With clogs. Gulu jewellery. Leona Edmiston hosiery. 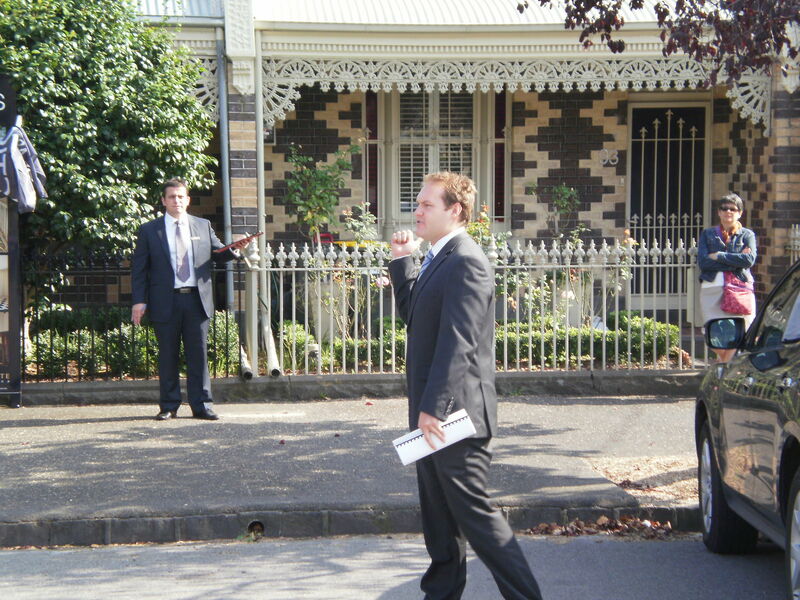 Home Truths attended four auctions today, from Fitzroy North to Fairfield, Carlton to Carlton North. Bang in the middle of all these locations is the perfect place to start your home hunting day – Pope Joan 77-79 Nicholson Street Brunswick East. We arrived bright and early to get started on the Domain newspaper, and we weren’t the only ones. It was chockers with oldies, newbies and babies. 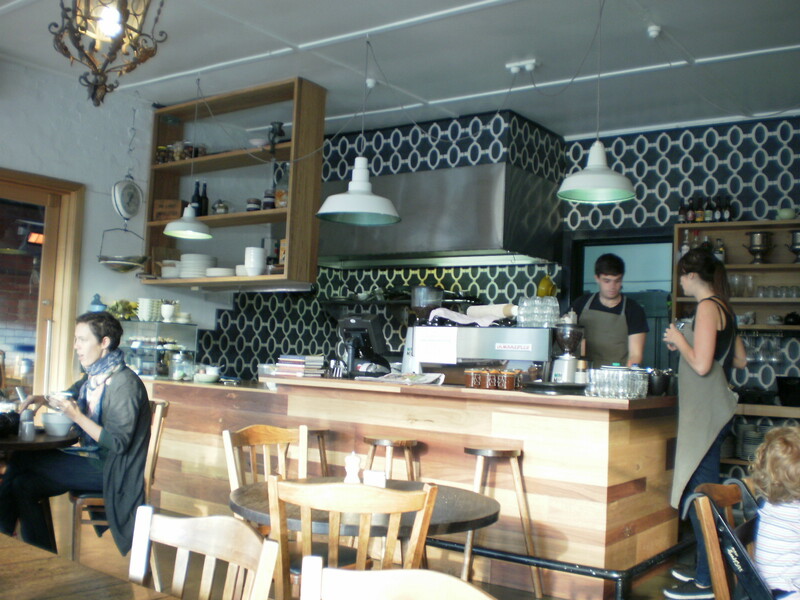 Warmly welcomed, we ordered a long macchiato which arrived in under a minute. It was beautiful and creamy, served in a glossy chocolate coloured old school cup. 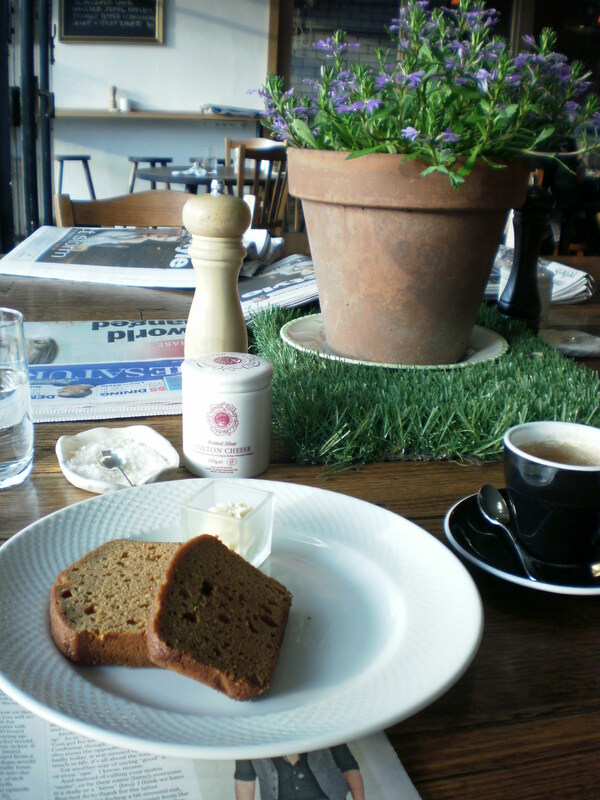 We ordered ginger bread with smoked maple butter which was delicately moist and warmed up my belly. Perfect. As we munched on this tasty morsel, we noticed David Barnes of Harcourts Carlton setting up his auction flags for the day. 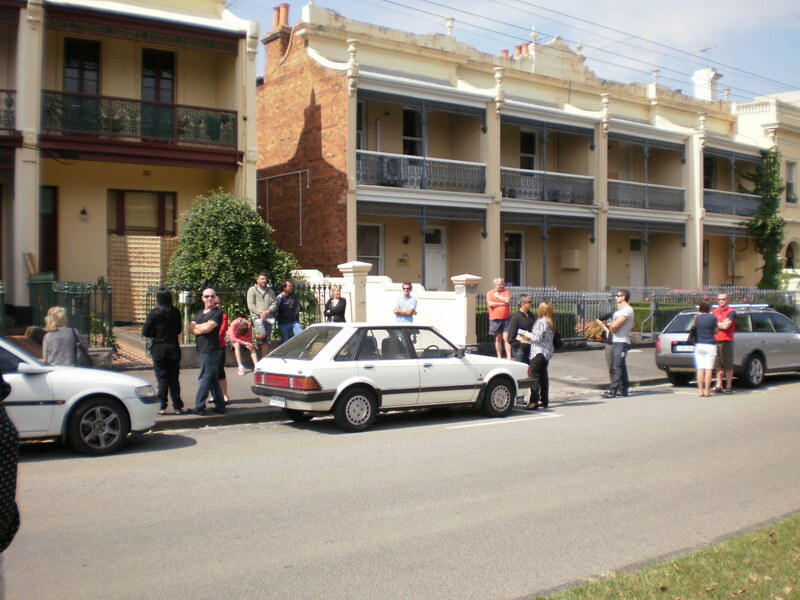 He went on to pop this property under the hammer, which was passed in at 16 Nicholson Street. Well worth a look if you’re after a four bedroom unit in a location close to Pope Joan and Brunswick East. But I digress. 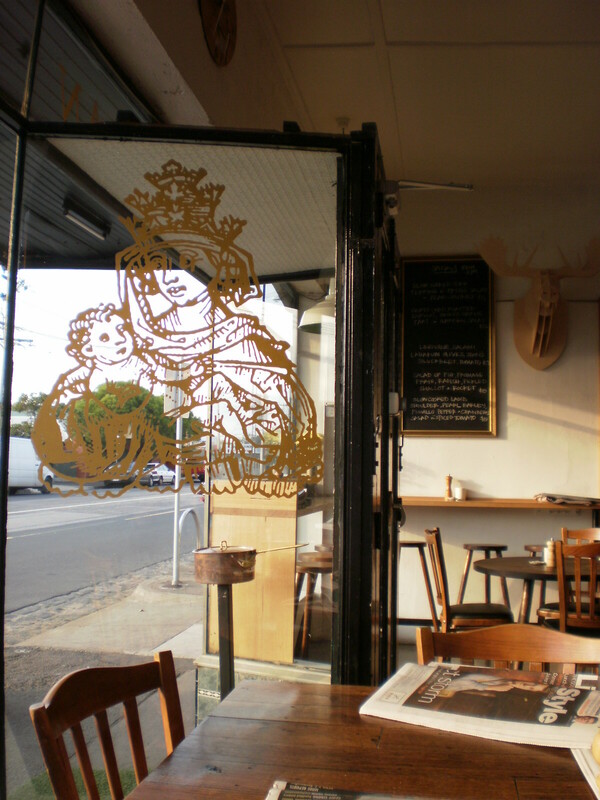 Pope Joan staff were welcoming, opening the door for locals as they left the premises, topping up water… the works. A great way to start the day if you’re hunting in this locale. Ok. One last photo below. Artistic, innit? Punters: Fitzroy North is a notoriously ‘everyone knows everyone’ neighbourhood, so there were a lot of locals having a squizz in the crowd. Interested bidders seemed to be either older investors or younger couples. LOTS of Dora the Explorer trikes around. Review: A cute home in a muchly-loved location, very close to a corner cafe and Queens Parade conveniences. Compact and contemporary, this was a classic two bedroom home with a slightly modified lounge and dining zone. Martha Stewart would love the kitchen, which was quaint and super glossy and white in a country style. Rear yard was undeveloped, but bright and with room for a Jamie Durie garden (if that’s your bag). Home would be suitable for those whose kids have left home (it’s on one level and close to everything) or a young couple who don’t want their in-laws to come round too often. Tres cute home. Home Truths wants to make it clear that passing in a property doesn’t mean failure – negotiating after sale can be just as effective given a willing buyer and vendor. 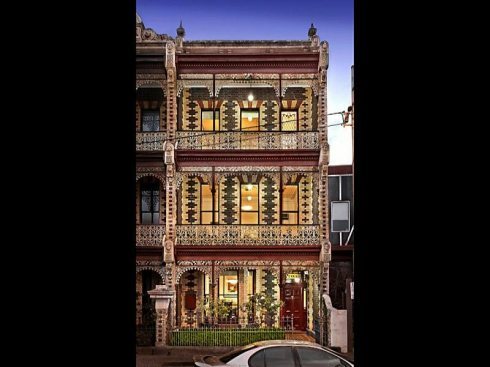 This was the case with AG Property’s iconic Holcombe Terrace 205 Drummond Street Carlton (image above) which was passed in on the 5th March, to sell privately with the underbidder just four days later for $2,700,000. 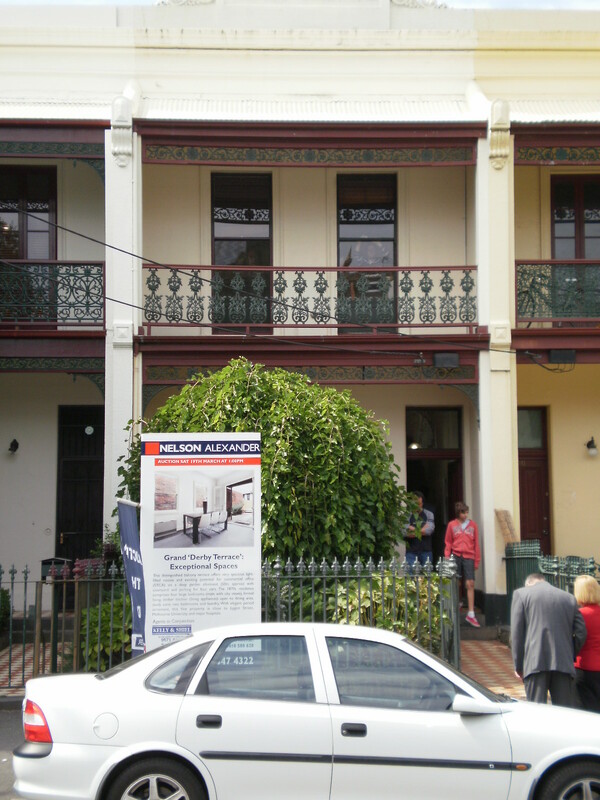 Agent Anthony Gattuso said ‘Holcombe Terrace was an exciting property to have on the market, as it was such a unique home and Carlton icon. As such, we found the right buyer who appreciated all of the home’s high Victorian drama’. Punters: A big range of buyers for this unit, and Home Truths expect that we’ll see more and more investors coming back into the market in 2011. A few older buyers browsing, but all the action was with young couples. 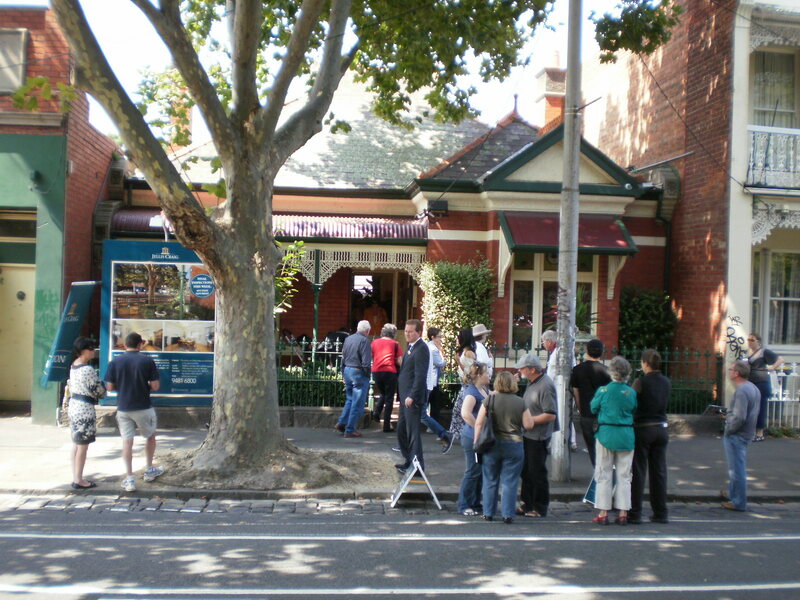 Home Truths had the chance to chat briefly with the underbidders of this property who were North Carlton locals. They were going to live in the home initially and then use as an investment. So far, they’d found their house hunting process OK and didn’t really have much to remark on either way. Maybe they were just nervous about the auction to come. Have you ever seen such a jolly auction grin? John Karr laying down the law in Fairfield. Review: This was a little one bedroom apartment with a nice-sized courtyard. For some reason there’s quite a few 1 bedrooms popping up in this area of Fairfield. John Karr called an elegant and quietly confident auction to a hesitant crowd. His tone was regular and calming, and he made interesting patter about the nature of Fairfield Park. The auction opened up at 330k and ended up passing in at 352k to an enthusiastic young couple. The property sold for 353500 – just a touch above the reserve. Home Truths interviewed John Karr, who remarks that Fairfield is a great area which will continue to sell well. 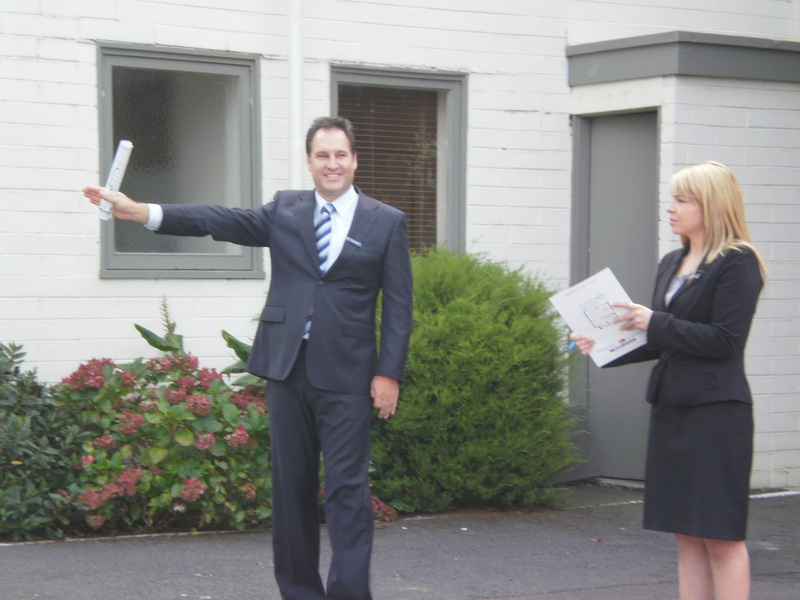 John feels that there will be less incidences of underquoting reports, and homes are now selling within the quote range. To see… and be seen. That kind of gig. Punters: This was the auction equivalent of a who’s who in Carlton. Serious buyers, serious money. Neighbours hoping for gangbusters results to improve the value of their own homes … a definite hob-nobbing vibe. As this residence (named Derby Terrace) was in commercial use, the buyers appeared to be those who’d renovate and speculate. Review: The auction was called by Tom Roberts of Nelson Alexander. Well, what can I say? This is one of those pieces of street theatre that comes along in real estate once in a blue moon. This was a grand ole girl terrace home, currently used as commercial premises. It was definitely a property for those with ideas of re-configuration into a traditional residence. The auction consisted of furious bidding by two determined buyers in a face-off that consisted of $5000 dollar rises instead of cussin’. It all got a bit OK corral. Tom called a beautiful auction with tight, swift patter and the occasional amusing quip. The auction opened at $1.5 million and finished up at $2.151. 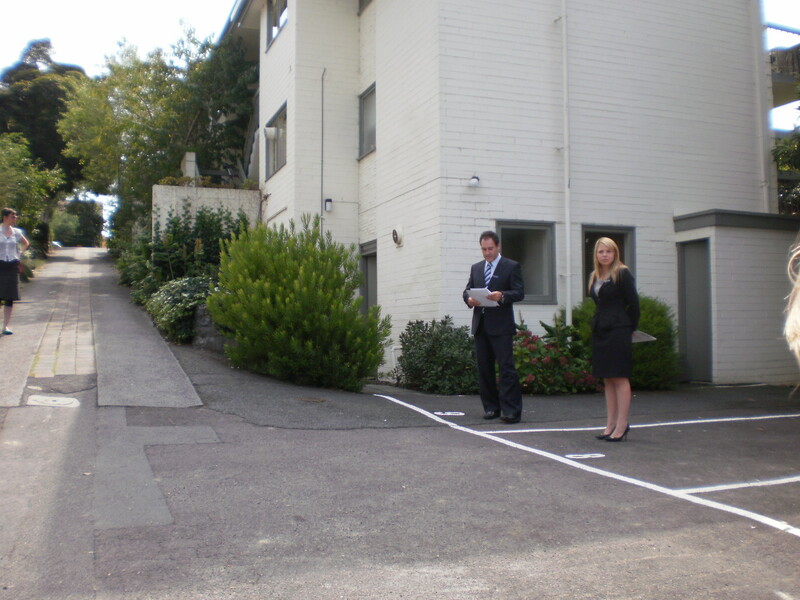 With assistance from AG Property’s Anthony Gattuso, the winning bidder has made their mark on Drummond Street. 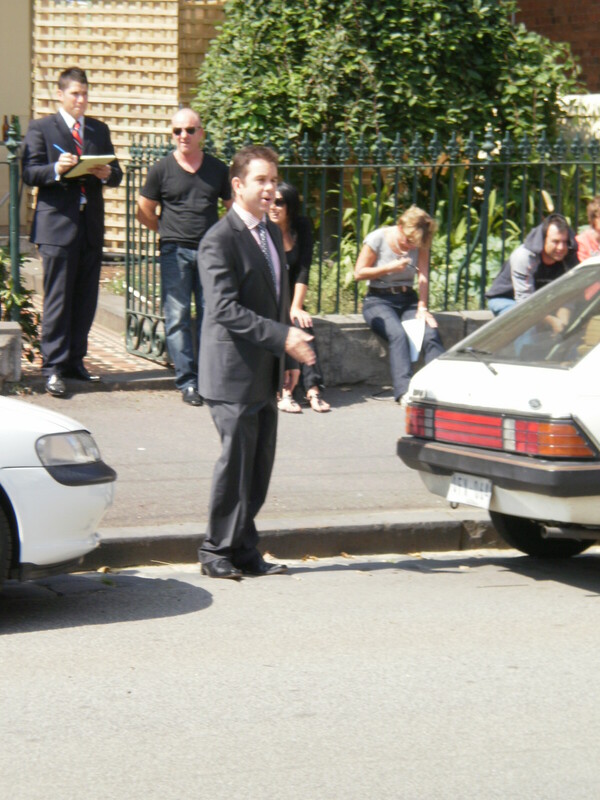 Amazing auction action, the kind Home Truths wishes you were there for. It’s a community event, y’all. 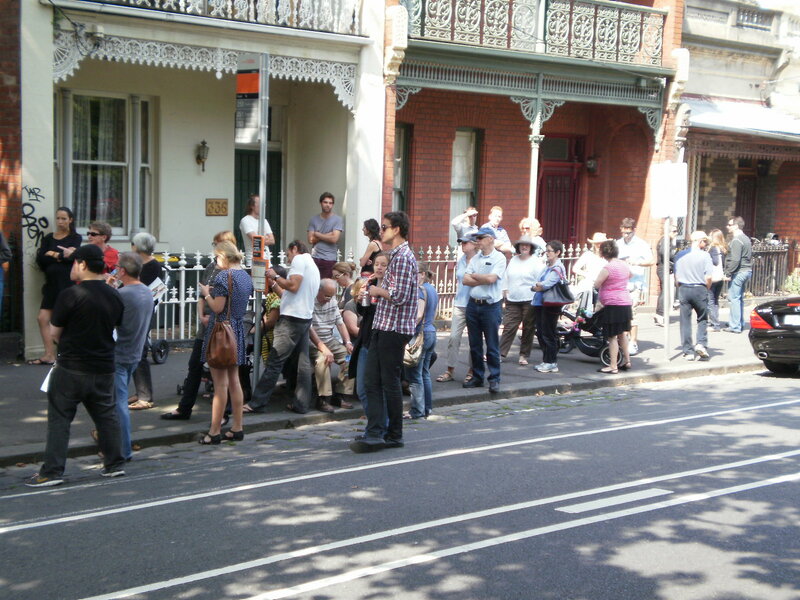 Chockers turnout to 338 Rathdowne auction. Punters: Rathdowne Village Carlton North on a Saturday afternoon is full of yummy mummies, sometime gangstas, neighbours and visitors to the village’s gorgeous cafes like Degani and Tre Bicchieri. This was no exception, and the crowd for this beautiful home’s auction was massive. Even the median strip was packed! A huge cross-section, but those with their hands in the air appeared to be more mature owner-occupiers. Review: 338 Rathdowne Street was a glowing jewel-box of a residence. Beautifully maintained although petite, this little home glowed. It also had a conservatory room which appealed to the Miss Marple in me. A wonderfully designed ROW with parking and large planters finished off the deal. Simon Shrimpton was both the agent and the auctioneer (a wonderful and rare thing to be) for this home, and he called an energetic and amusing patter to the crowd. And boy – what a hard crowd! You could probably make paddlepops on their steely gazes. Simon kept it light and coaxed both laughter and interaction from the crowd. The home started off at $1.2 million and was eventually passed in at $1.270 before being sold for in excess of $1.3 million that afternoon. Simon remarked that the vendors were very happy with the result, and that the Veuve was flowing! 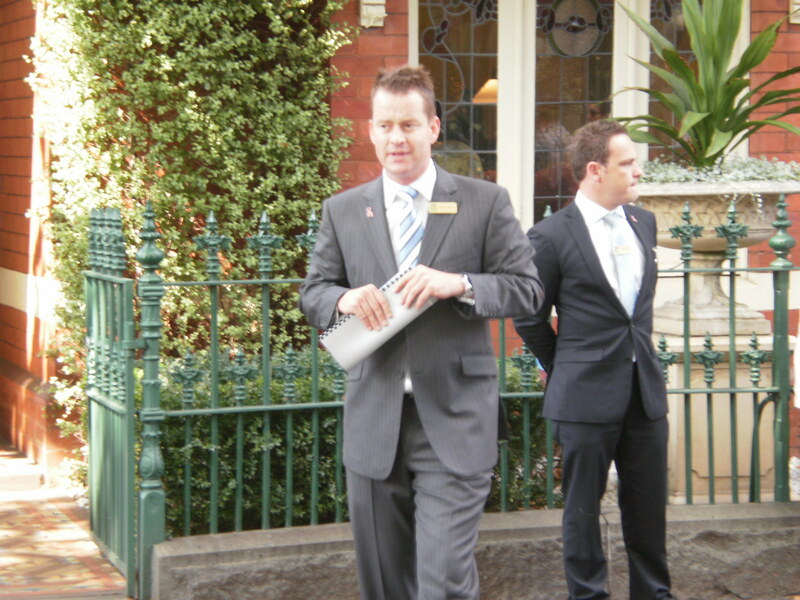 He said that Jellis Craig had a very successful afternoon across their network with 31 selling out of 37 auctions. So. That’s Home Truths One. Did you enjoy? Become a subscriber to our journal and find out more about the underbelly of Melbourne auction scene. Have you or your business been mentioned in today’s Home Truths? Contact info@rubyslipper.com.au to find out about sponsoring Home Truths and getting maximum exposure to the right market. *Home Truths Melbourne has gathered this information to provide an interesting document for readers and subscribers. Information contained herein is gathered from a range of sources including but not limited to; local press both virtual and hardcopy, Valuer General Information & Agents own investigations. All efforts are made to verify the information provided. The information is not to be relied upon or used in dealings with third parties and people should make their own investigations regarding their own property or personal circumstances. Opinions and observations offered should not be treated as fact.